Recording King instruments were sold by Montgomery Wards. Most of these instruments were made by Gibson in the late '30s to '40s, and although they were the "bottom line" at the time for Gibson, they are very well made by todays standards. The recording king name has been resurrected and is currently a division of The Music Link in the U.S.A., and a division of A.X.L. Corp. in international markets. They offer Banjo's, Guitars and resonator instruments, including guitars, mandolins, and Ukuleles. 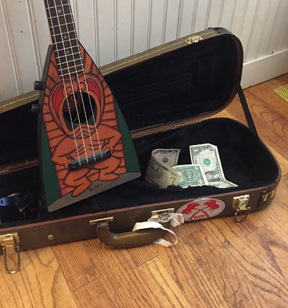 The Recording King Resonator Ukulele specifications are identical to the Johnson branded Resonator Ukuleles, (also distributed by "The Music Link") except for the head stock decal, and the fretboard material. On the Johnson, the Fretboard is "Ebony" on the rRecording King it is "rosewood". There are rumors that they are made by the same factory. Recording King also offers several "Art" Guitars and Ukuleles, depicting Hawaiian and cowboy scenes.